A Happy elixir: Grandma Sugar’s gumbo and shared laughter with her, left; Linda, a friend of Grandma’s youngest sister Sue; my husband Walter; and Sue. Grandchildren are not the only individuals who have delivered megadoses of healing during my stroke recovery. During the past two weeks, I have been blessed with some good family medicine. My husband Walter’s Aunt Sue, about five months his elder, drove down from Kentucky to visit relatives and her hometown of Biloxi. 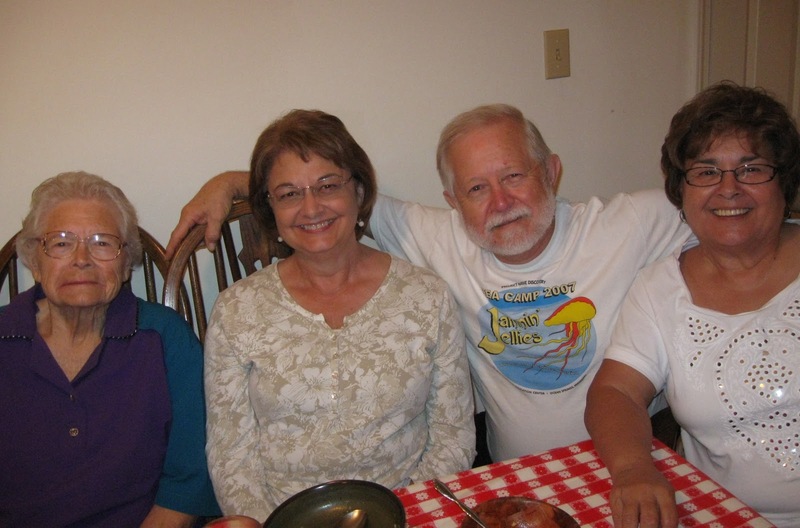 Sue has lived in Kentucky for more than three or four decades, and her visits are always memorable. She is one of those individuals who creates a sense of well-being in those around her, served up with generous helpings of laughter. Her neighbor and friend Linda accompanied her and added to the fun of sitting around the dinner table sharing stories old and new. A recent visit with my mother produced another memorable family experience for me. Three sisters, cousins of mine who have lavished love and caring attention on my mother, surprised me when Walter and I arrived at Mother’s. 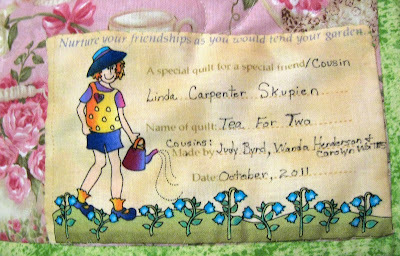 These talented ladies presented me with a beautiful hand-quilted creation in a “Tea for Two” pattern. 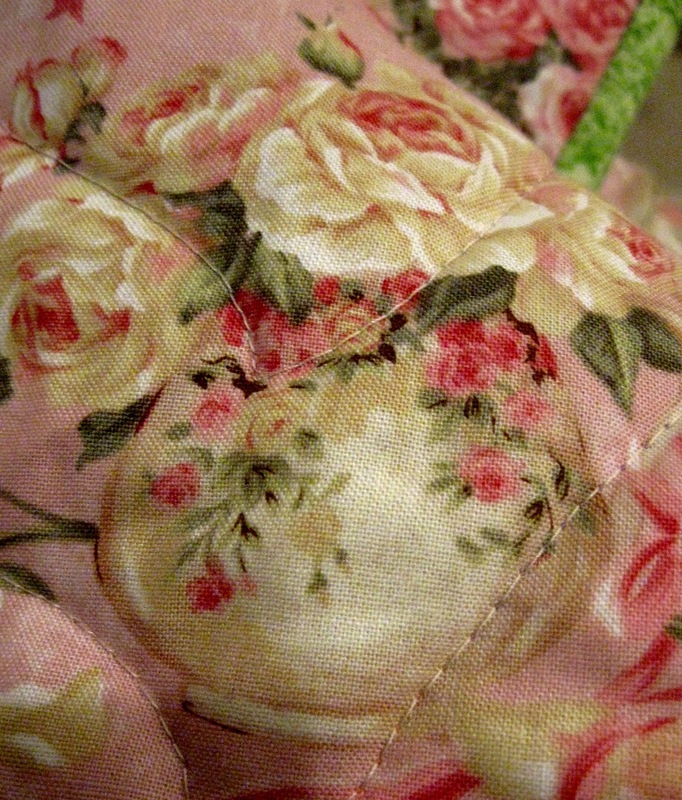 I know every stitch was stitched with love. These cousins pour on the blessings. 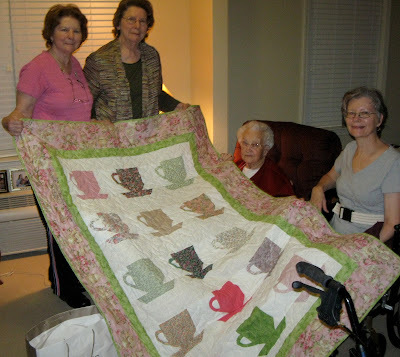 Carolyn, left, and Judy help Mother and me get a good look at the comfy quilt that celebrates my addiction to hot tea. 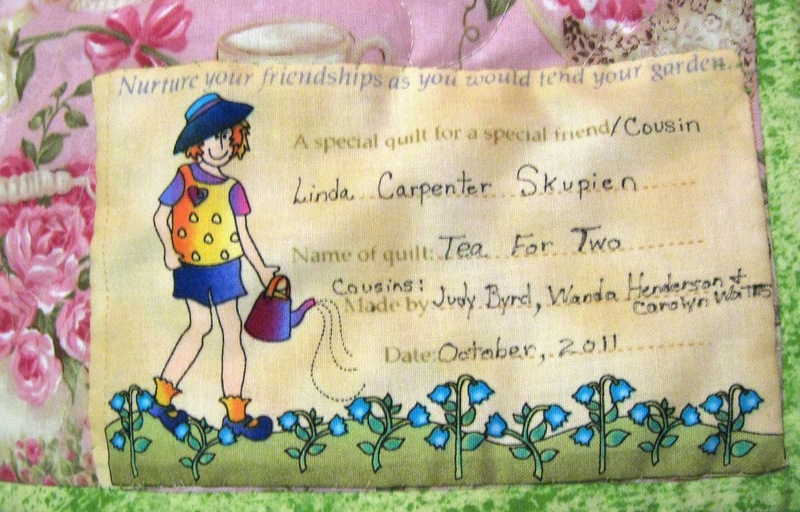 Judy was the instigator of the teatime theme. She knows I love hot tea. 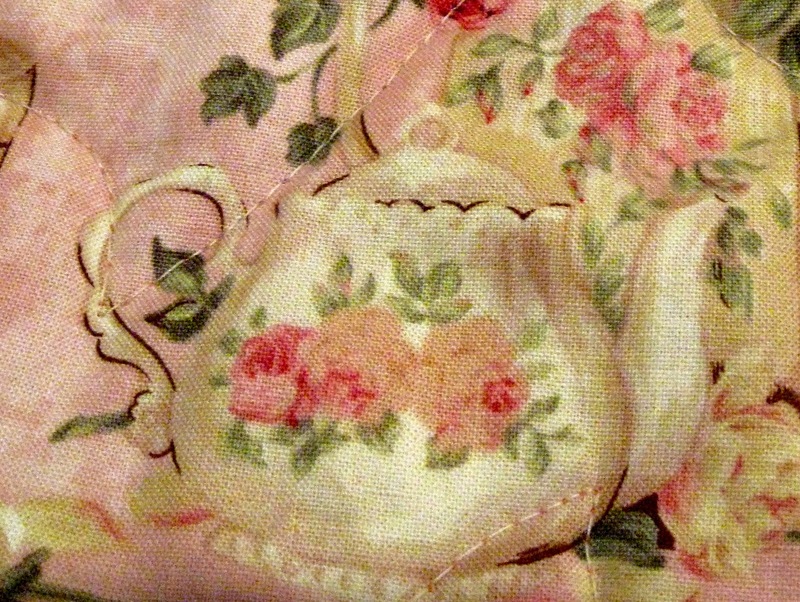 On a visit during my inpatient rehab, she brought me a box of fruit-flavored tea bags with a Bible verse printed on the little tag attached to the string on each tea bag. What a warm pleasure and comfort that was during my hospital stay. Carolyn found the backing fabric that featured all the china pieces needed for a fabulous tea party. Not wanting my coffee-drinking hubby to feel left out, my cousins assured him the cups they so carefully created could also be considered coffee cups, and we could share the quilt. Temperatures are scheduled to dip here tonight. With the new quilt and a fire in the fireplace to warm our outside and hot tea and coffee to warm our insides, I just may be drinking my early morning hot tea tomorrow enjoying a snuggle with hubby wrapped in the “Tea for Two” quilt. Can you see the hand-quilted stitches in the photos below? 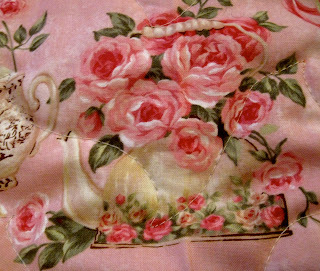 Tea kettles and . 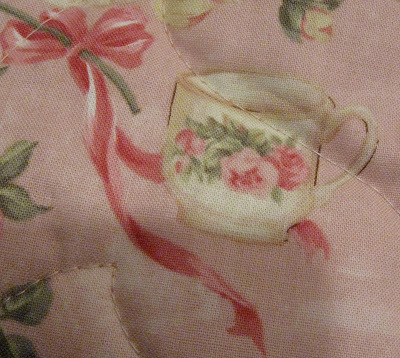 . .
Teacups, all grace the backing fabric and edge the front in lovely pink and green. Oh, this is just beautiful, and specially made for you! Your cousins are the best!!! I am so glad you are recovering so well and having good times with friends and family. It is to snow here tonight!!! Up to three inches!! How fun. I love it. Yes, cousins are the best. I'm glad you had some good family time. so beautiful, the people and the quilt. i like that label and love the name grandma sugar. What a wonderful support system you are blessed with. That lable is perfect. Stay warm, we hit 31 this AM. What a wonderful gift!! And how blessed you are with family, LC. Life really is beautiful, isn't it? 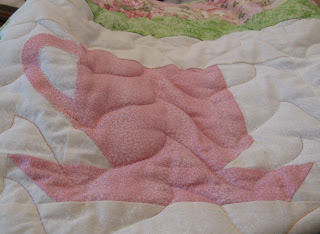 This is a stunning quilt but not more stunning than the love put into it. Your family and friends are such a wonderful support base for you. Enjoy your tea and the cozy fire. That sounds delightful. I have to remember the scripture teabags as a gift idea. I like that. What beautiful work. I really envy you the snuggly quilt. What a beautiful and thoughtful gift! I love it!